FlexEx Effectively exercises and strengthens the hands, fingers and forearms and can even rehabilitate an injured wrist (Carpal Tunnel, etc. ), hands, fingers and forearms without any bulky, bothersome contraption. This is one of many tools I use to try and keep my wrist/forearm muscles strong. I have a lot of issues with my hands due to overuse of keyboards, mice, and video game controllers. I bought two of them and keep them next to the couch so I can exercise while watching tv shows/movies. This pack is perfect for those with weakened hands due to repetitive injury such as carpal tunnel, tennis elbow, etc. or those looking to rehabilitate hands and fingers post-surgery. Pack includes 3 resistances so you can strengthen your hands gradually by starting with the yellow (light resistance) FlexEx and working your way up to the Red One! The Yellow FlexEx offers light resistance and is used for physical therapy, rehabilitation, and by those with weakened hands possibly due to carpal tunnel syndrome or post-surgery, etc. 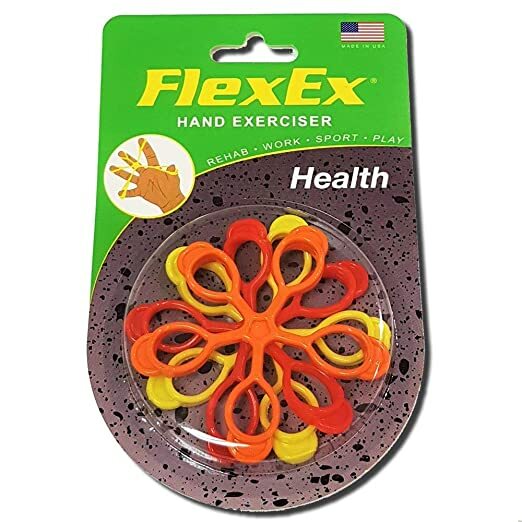 The Orange FlexEx offers Medium/Light resistance and is perfect to use after you have strengthened your hands with the yellow ones and need a bit of a challenge to continue your strengthening program. The Red FlexEx offers medium resistance and is suited for most individuals wishing to strengthen their hands, forearms and fingers e.g. computer users, and those who play a musical instrument. Pack Includes 1 Yellow (soft), 1 Orange (medium-soft), & 1 Red (medium). Strengthen your hands the simple, easy way with FlexEx, for Strong, Healthy, Pain-Free Living! Strengthen your Hands and Improve your Sport with the FlexEX HEALTH! Proudly Manufactured and Packaged in the USA!